The Cassini spacecraft, using its radar system, has discovered very strong evidence for hydrocarbon lakes on Titan. 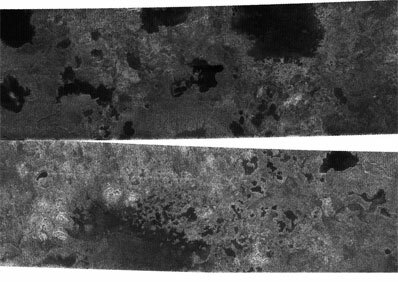 Dark patches, which resemble terrestrial lakes, seem to be sprinkled all over the high latitudes surrounding Titan's north pole. Scientists have speculated that liquid methane or ethane might form lakes on Titan, particularly near the somewhat colder polar regions. In the images, a variety of dark patches, some with channels leading in or out of them, appear. The channels have a shape that strongly implies they were carved by liquid. Some of the dark patches and connecting channels are completely black, that is, they reflect back essentially no radar signal, and hence must be extremely smooth. In some cases rims can be seen around the dark patches, suggesting deposits that might form as liquid evaporates. The abundant methane in Titan's atmosphere is stable as a liquid under Titan conditions, as is its abundant chemical product, ethane, but liquid water is not. For all these reasons, scientists interpret the dark areas as lakes of liquid methane or ethane, making Titan the only body in the solar system besides Earth known to possess lakes. Because such lakes may wax and wane over time, and winds may alter the roughness of their surfaces. Repeat coverage of these areas should test whether indeed these are bodies of liquid. These two radar images were acquired by the Cassini radar instrument in synthetic aperture mode on July 21, 2006. The top image centered near 80 degrees north, 92 degrees west measures about 420 kilometers by 150 kilometers (260 miles by 93 miles). The lower image centered near 78 degrees north, 18 degrees west measures about 475 kilometers by 150 kilometers (295 miles by 93 miles). Smallest details in this image are about 500 meters (1,640 feet) across.